If you're an estate agent, developer, or broker, you know that the real estate world moves quickly. Today, teaming up with an experienced CPA firm that's capable of delivering prompt and accurate financial data is more important than ever. At FOUDY CPA GROUP, PC, our Fort Wayne, IN CPA firm is adept in real estate accounting and offers the industry-specific services your business needs to stay on top of the marketplace. We can take over routine bookkeeping tasks that strain your resources and provide specialized real estate accounting services like cost segregation, 1031 exchanges, and passive activity deductions. We'll find practical solutions to minimize risk, cut costs, and sustain cash flow, so your business can remain profitable through seasonal shifts and dips in the economy. Our tax planning strategies will not only reduce your tax burden and increase profits, but will ensure you avoid transactions that could flag you for an audit. 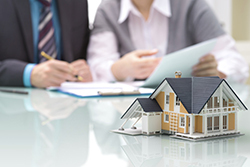 When we work with real estate professionals, we deliver a comprehensive package of accounting services and tax strategies that will make your business strong and resilient, come what may. Call us at Fort Wayne: 260-432-4565 or Bluffton: 260-824-1040 today for more information or request a free consultation online now.